The 50th anniversary of the Ford Mustang will be celebrated at the 2014 Silverstone Classic, scheduled for 25-27 July at the Silverstone Circuit in England. First unveiled in New York during April 1964, the Mustang is celebrating its 50th birthday in 2014 – a milestone that will be marked both on and off the Grand Prix circuit at the historic motor racing event. Next summer’s races have been chosen by the Mustang Owners Club for its official anniversary celebration for the Ford Mustang. 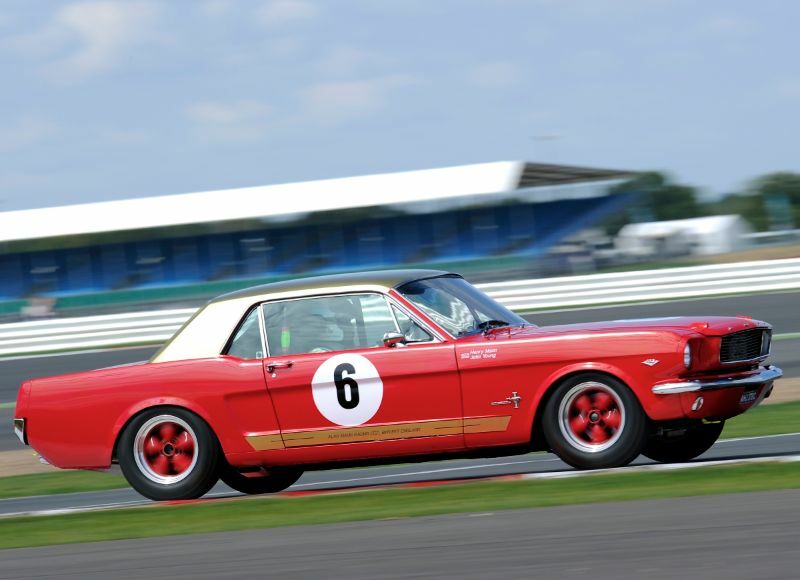 The 2014 Silverstone Classic weekend will not only include dedicated displays and parades showcasing all five generations of the Mustang but also two races dedicated to American V8-powered machines from the Sixties. While the packed 50-plus car grids will also include other ‘Yank tanks’ from the era, the majority of the field will consist of competition-prepared Mustangs all galloping into Silverstone to honour the occasion. Introduced in 1964 as a small (by American standards!) sports car, the Mustang was an immediate success with more than a million sales in its first two years. It’s name, and then revolutionary long bonnet/short boot design, inspired a whole new breed of affordable, compact, high performance street machines still known today in America as the ‘pony car’ class. Initially hardtop coupe and convertible body styles were offered but a 2+2 fastback version was quickly added to the original model line-up. For those who wanted some extra performance, a collaboration with Carroll Shelby produced the even more muscular Shelby GT350. The Mustang’s motorsport history also dates right back to the early days. It made its racetrack debut within a month of its introduction as pace car for the 1964 Indianapolis 500. Later in the same year, Mustangs started racking up the first of many notable competition successes with class victory in the Tour de France road rally. The following year an Alan Mann Racing-entered 4.7-litre Mustang raced by Roy Pierpoint won the British Touring Car Championship, while Shelby GT350 Rs captured a host of top titles back home in the US. A host of notable international victories have followed since. For more information, visit SilverstoneClassic.com.